The Hunger Games was a movie about children who are forced to fight each other to the death in an apocalyptic arena, for the entertainment of millions. 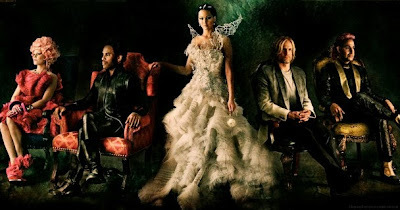 The forthcoming sequel The Hunger Games: Catching Fire (and this is, I suppose, spoilerish) is about former victors of past bloodbaths, coming together to fight each other to death again, like it was Survivor: All Stars or something. It is about as dark as a movie for kids could possibly ever be. And yet the National almost didn’t make their way onto the movie soundtrack because, as frontman Matt Berninger says, their song was “too dark.” The National, then, must be heading into their Throbbing Gristle phase, right? Let’s back up: The Hunger Games: Catching Fire is out this fall, and Berninger tells NME that the National will, in fact, appear on that soundtrack album. That’s probably not a huge surprise, since the original movie’s soundtrack had people like Arcade Fire, Neko Case, and the Decemberists, alongside the Taylor Swifts of the world. Still, it’s a pretty big look for the National, since approximately one billion people will see this movie. The National’s song is called “Lean,” but it was originally titled “Dying Is Easy.” And yes, Berninger thinks that the whole “too dark” thing is weird, too. “Lean” will join Coldplay’s “Atlas” on that soundtrack. The movie hits theaters 11/22. Team Gale.